1 OWNER!! Clean Car Fax! Non Smoker's Car! Power Moon-Roof! Automatic! Leather Seats! EX-L Model! This Accord is a nice Toyota, clean, 1 owner, well maintained, garaged, not driven hard, serviced. This Accord has it ALL, power sun-roof, power seats, power windows, power locks, power mirrors, tilt wheel, cruise control, automatic climate control, steering wheel controls for sound system, CD player, alloy wheels, leather seats, heated seats, key-less entry, even a trunk access for lots of cargo space. This is a LOT of car for the money. We have fully serviced, Missouri safety inspected, and road tested this Honda, it is ready to go. 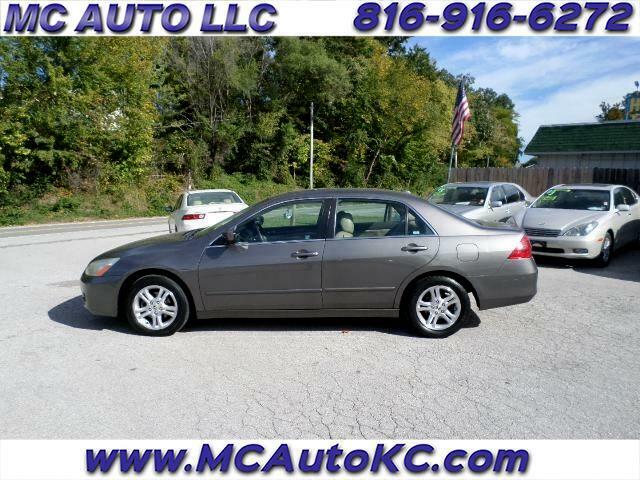 It will be hard to find a car as nice as this Accord and priced right also!! And lastly, we do not try to sneak in any hidden fees, like paperwork fees, admin fees, or doc fees. Call if you need any other information or need to schedule an appointment. CALL 816-916-6272 OR 816-665-7371 or visit us at www.mcautokc.com .